Skil Table Saws are lightweight and easy to carry. A lot of people, do-it-yourselfers in particular, prefer to use these saws as they are easy to operate and fairly reliable. Let us take a look at the advantages and the disadvantages of these saws.
. Powerful 15 AMP motor.
. Die cast miter gauge.
.	Rip fence magnifying lens which improve accuracy in measurements.
.	High quality carbide blade. A table saw by Skil is portable in every sense of the word. They weigh only about 50 pounds. They come with integrated carrying handles and so they are very easy to carry. They are compact in size and do not occupy a lot of room and hence storing them is not a problem at all. They come with a sturdy leg stand as well. Most importantly, these saws are very affordable. 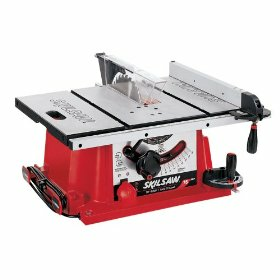 In fact, they are one of the lowest priced table saws on the market today. So, they give you good value for your money. Now, let us take a look at the downsides of Skil table saws. The most important weak point that all the table saw reviewers seem to mention is the nonstandard miter slots. Usually, miter slots measure out at 3/4th of an inch. Instead, in these saws, the miter slot measures out at 5/8th of an inch. What this means to you is that you will not be able to buy and use readymade crosscut sleds, jigs, miter gauges, and other such attachments. So, unless you are planning to use the miter gauge and other attachments that come with Skil saws, you will find it a little disappointing. Another important point that a lot of people have mentioned is that it can be difficult at times to fix the blade at 90 degrees to the table. To do so, you might have to loosen a screw or two and force the blade to the right position. While it is not a big problem, it can be annoying at times - particularly for people who are used to using high end table saws. Since the motor is quite powerful, the noise it makes when you operate these saws can be quite loud. So, some of thse table saw reviews have suggested using ear protection while using these saws. Based on the reviews, it can be said that Skil table saws are neither great nor very bad. They are above average and though the design and the features are pretty basic, are good enough for do-it-yourselfers who want to do some home improvement projects and minor woodworks. Return From Skil Table Saws Page to Home - Finishcarpentryhelp.com.